See about your Tax Credit. Click here. Once we reach 90% AFUE or better, venting and combustion processes change a bit. These high efficiency furnaces are direct-vent appliances, which means that both exhaust and intake air (combustion air) are piped directly to the outside. No indoor combustion air is utilized. The combustion chambers are sealed for better control of the combustion process. These high efficiency sealed combustion condensing furnaces utilize a second heat exchanger. The usually hot flue gasses are cooled down to the point where water vapor condenses. This process allows extraction of additional heat, increasing the unit's efficiency. Both the vent and combustion air intake of a high efficiency furnace can be piped in horizontally, as well. This eliminates the necessity of a large sheet metal flue out through the roof of the residence. If a high efficiency water heater is installed, as well, the sheet metal (B-vent) flue may be completely eliminated. You can't have fire without air. All gas-fired appliances must have air for the combustion process. Atmospheric combustion appliances (80% AFUE furnaces and standard water heaters) pull air from inside the residence for this purpose. Therefore, an outside air intake is usually ducted into the mechanical room of the residence. This has been a great frustration for homeowners to have all that cold air dumping into their homes. Sealed combustion appliances, including high efficiency furnaces, bring in their own air for combustion direct into the combustion chamber. No cold outside air must be introduced openly into the mechanical room for this type of furnace. This is another good argument for installation of a high efficiency water heater, as well. 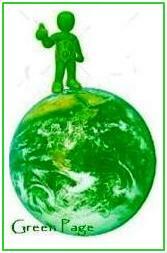 The do-it-youselfer should be aware of venting restrictions and requirements. Most sealed combustion furnaces are provided with 2" intake and exhaust ports. This does NOT mean that this is the size piping needed for proper venting. You must do the math. The installation manual will have a venting chart, which gives maximum lengths for each size of piping allowable. Depending upon the length of run, the btu output of the furnace, and the amount of elbows needed, will determine the pipe size required for proper venting. For each 90* ell used, you must deduct 5' from the maximum allowable length. For each 45* ell, deduct 2 1/2' from the length. The vent and combustion air piping will usually be 3" or 4". If you must increase size, this must be done at the unit with increasers. A concentric termination is a great way to terminate your pipes outside. The concentric termination is a PVC cone with a pipe sticking out through the center. It is a single pipe coming out instead of 2 separate pipes. The combustion air is pulled through the rear of the cone, and the exhaust is pumped out through the center pipe. Much more attractive than the 2 pipes coming out. Check your manufacturers requirements carefully. Some manufacturers do not allow concentric terminations on their high efficiency furnaces, due to recirculation possibilities. Some do not allow concentric terminations for particular furnace sizes. Some require a reduction in the piping as the vent exits the structure. Also, some require long-sweep ells. As stated above, these high efficiency furnaces produce condensate, which is where they get part of their name. 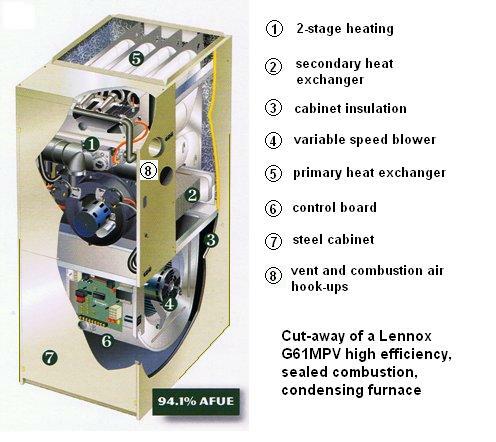 A condensing furnace recovers waste heat from the exhaust gases, which would normally be sent out into the atmosphere. These units have a larger heat exchanger surface, which pulls heat from water vapor being produced during combustion. The condensate must be disposed of. This condensate water is acidic. Cast iron and plastic drains are usually acceptable for condensate disposal, but not galvanized drains. Some municipalities have strict codes governing condensate disposal. Check with your local building authorities for proper disposal requirements.